Fat Albert Movie Hey! Hey! Hey! 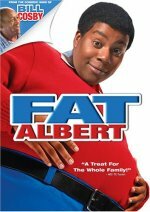 Fat Albert release date was Saturday, December 25, 2004. Live-action version of the Saturday morning television cartoon (1972-85) following the misadventures of a group of adolescent boys growing up in a Philadelphia neighborhood, focusing on an obese boy named Albert and his friends Rudy, Mushmouth, Bill, Dumb Donald, Russell, and Weird Harold. Fat Albert pulls his pals into trouble when they fall out of their TV world into the real world, where Fat Albert tries to help a young girl, Doris, make friends. However, the simple life of the group is interrupted when Fat Albert falls for Doris' older sister, Lauri, sparking his friends to worry that their leader may never want to return to his cartoon world. The film will start with animation, move into live-action and end in the animated world.